Laurie Loves...: A Christmas Cocktail! I'm not much of a cocktail drinker. Wine and something bubbly are my usual go-tos. But I do like to serve something different for holidays and parties. I found this lovely libation in a magazine while relaxing by the fire.. 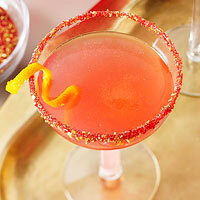 I think this cocktail is the perfect potion for a Christmas brunch with its combination of ruby red grapefruit juice, tangerine flavoured vodka and Prosecco. It's a unique twist on the classic Screwdriver and Mimosa. Click here for the recipe ( from the December issue of Better Homes and Garden magazine ) and enjoy sipping this sparkling cocktail while you open your gifts on Christmas morning.